Faith is a daring adventure. It might not look like it. But that’s because we can’t see everything with our eyes. 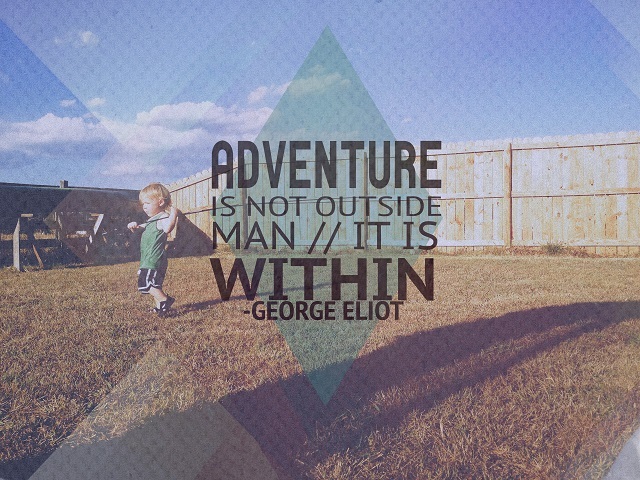 Like George Eliot has said it “Adventure is not outside man//It is within”. The biggest battles are fought within. The greatest adventures are experienced within. The hardest battle of all might be to believe that God exists and that he wants amazing things for every one. The enemy will do everything in his power to keep us from receiving the gift of faith. But if we open our heart to God’s word and believe in Jesus, we are real troopers of faith. The battle of faith is an ongoing adventure. It is always a question of trust and surrender. Do I trust and surrender to God today? Do I let Jesus be Lord of every area of my life? Do I let Jesus to carry my burdens or do I still try to it on my own? Do I give my painful past to Jesus or do I keep that section of my life away from God? Do I submit my new relationship/job/vacation plans for God or do I want to take a stay-away-cation from God? These are huge inner battles we are facing every day. Faith is an adventure first within us. Do we dare to trust God today? Do we dare to say “Thy will be done” to God in every situation? Because we really do not know what God will do, do we? We really don’t know how Jesus is going to resurrect our past, right? This inner battle goes on until we submit fully to Jesus, until we surrender everything to God. We just need to trust that God exists and wants the best for us also today. When we do this, God can use us for his various purposes in the world. Only after these inner battles we are fit for the kingdom use. But even then we might be called for work that no one ever notices. We might be prayer warriors that upheld the church. Or our calling might be to love others through compassionate service. Nonetheless faith is always an adventure. The most difficult battles are fought within us: Am I a servant of God also today? Do I dare to approach the throne of God with my battle scars or not? Do I let God use me today or not? If we dare to believe….then we can by faith reach out as God directs us. We can experience everything God has planned for us. you help us to surrender everything to you. you equip and empower for your service. May only Thy will happen in us, through us. Q4U: Have you had hard inner battles? How are your faith adventures going? Be blessed, my fellow pilgrim, on your daring faith adventures!